Last week it was announced that Guns ’N’ Roses would be one of the headliners of 2019’s Louder Than Life music festival. Yesterday, the event— which will take place Sept. 27-29 at the Highland Festival Grounds at Kentucky Exposition Center — unveiled the rest of the festival’s lineup. 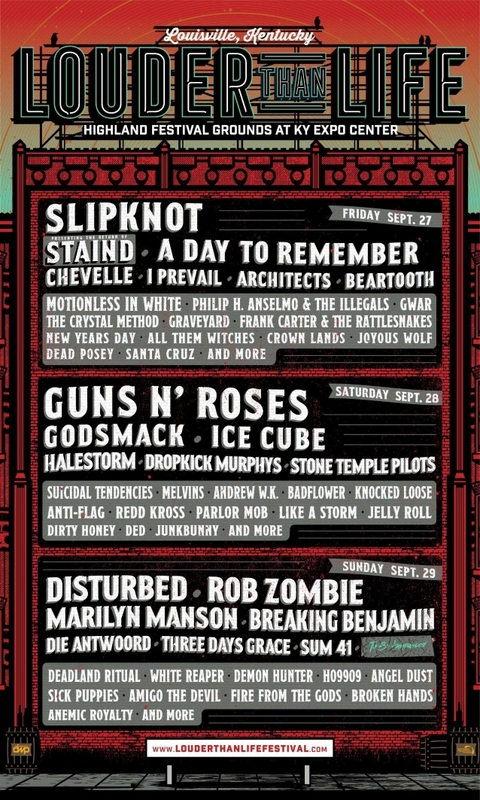 Joining GNR at or near the top of the bill are Slipknot, Disturbed, Rob Zombie, Godsmack, Ice Cube, Staind, A Day to Remember, Marilyn Manson and Die Antwoord. See below for the complete lineup. Tickets for Louder Than Life are on sale now via louderthanlifefestival.com.